Enjoying the peacefulness of the Eagle River in Southern Labrador, Canada this man spends the day in his boat fly fishing. This fishing guide at the Rifflin'Hitch Lodge in Southern Labrador, Canada decided that fly fishing from the boat was the better choice on this day. A basic boat is all you need if you prefer to stay dry while fly fishing on the Eagle River in Southern Labrador, Canada. Fishing Guide at Rifflin'Hitch Lodge, fly fishing on Eagle River, Southern Labrador, Labrador, Newfoundland Labrador, Canada. Model Released. 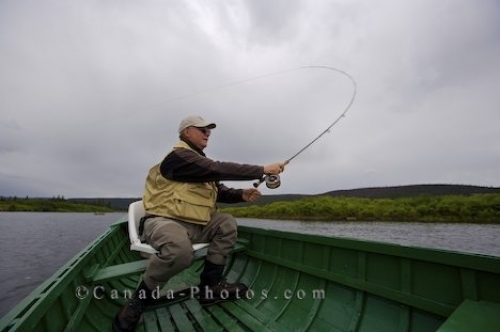 Picture of a fishing guide from the Rifflin'Hitch Lodge in Southern Labrador, Canada fly fishing in the Eagle River in a boat.